The best part of the Star Wars arcade games of yore was how they transported you into the movies, letting you be the one destroying the Death Star and defeating the Empire. A new bunch of Star Wars machines are going to do the same thing for today's audiences, starting next January. 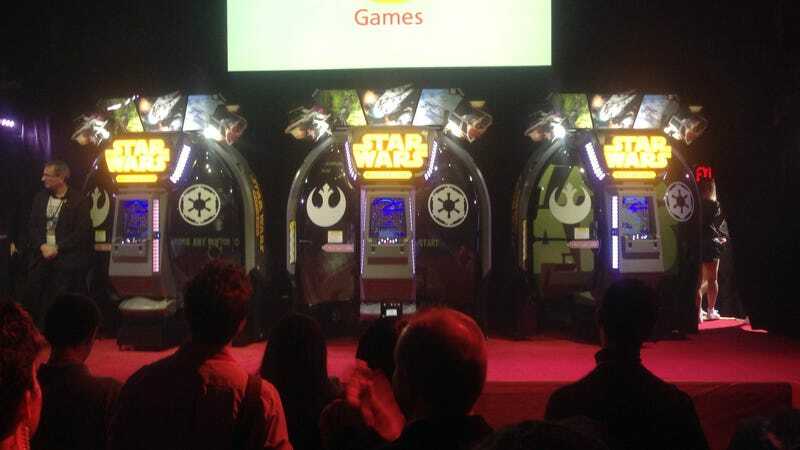 Star Wars Battle Pod is an arcade game that happens in a set-up with a dome-shaped screen. The game incorporates scenes from past movies and players will pilot the X-Wing, Snow Speeder, and the Millenium Falcon vehicles across locations like Yavin, Hoth, Endor and the second Death Star. The game will also feature a Vader's Revenge special stage, where the Sith Lord tries to detonate a Death Star laser core before the Rebels can acquire any sensitive info from the destroyed space station. A limited time preview of the Battle Pod machines will start today at the Dave & Buster's in Manhattan, running until November 2. Update: Here's video of the game in action.